How does double strike work with infect? phycomizard ALSO I forgot about the end of your comment, sorry! The Hivelord, Constricting, Megantic and Homing Sliver all feel kind of unnecessary. They cost too much and are more of a flavor thing than anything else. Homing Sliver I actually almost put in, but didn't think it was worth the space. Not only do I have to pay 3CMC to play it on T2/T3, but I also have to pay whatever mana cost for the sliver I end up choosing as well. 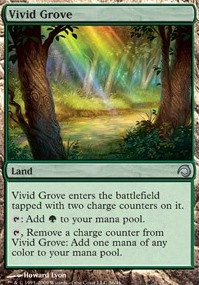 The only thing I saw it worthy of is some sort of thing like I use the slivercycle, find a Virulent Sliver and then either paying the mana cost before combat OR Aether Vial ing in the Virulent after going to combat, swinging (maybe with everything depending on board status for both myself and the opponent) with all my slivers and then doing poison counters like that for a potential (but unlikely) on T3 win, unless I have lke 2 or 3 Predatory Sliver s or Sinew Sliver s out to buff one another. PLUS at that point, if I'm going for an infect win I might as well add in buffs like Blossoming Defense or Distortion Strike or like Groundswell or something to buff them up, but for decks like Affinity I'm sure they'll have either answers or wouldn't let something just go unblocked if I have one or more Virulent Sliver s sitting on board. You might want to drop Virulent Sliver. While poison counters always are fun, the ability poisonous makes it so that you have to hit them 10 times, and at that point you probably want to have already won. My suggestion would be to sub it with Bonescythe Sliver, or maybe more lands. 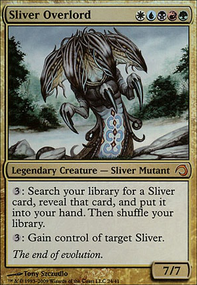 Is there a reason for Virulent Sliver? It seems to have anti-synergy with the slivers that give power bonuses, since the Poisonous effect doesn't scale. Maybe they'd be better as a sideboard option against lifegain-heavy decks? If you're going for full multiplayer, then your build will really be affected by how casually you want to play. Infect itself will put people on guard already, but if you're not in a competitive group then you could use some cards that otherwise might be too slow. I would say that Triumph of the Hordes is honestly redundant and pointless if you're gong to use creatures that already have infect in abundance. What it does help with is creatures that have poison x but not infect like Sabertooth Cobra or Virulent Sliver. That's the casual stuff though, and is on par with Giant Growth effects. If you want to play high end magic, then you'll want play dirty. Things like extra combat step and extra turn cards and honestly end up playing like a Narset deck. In multiplayer games, a general rule to take note of for infect is no blockers equates to more damage than higher power (in my experience at least). 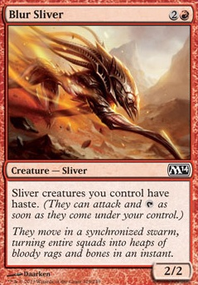 I suggest to throw out Virulent Sliver (Poisonous is not Infect, you need to hit 10 times and the power of the creature doesn't matter) and put in Plated Sliver or Sidewinder Sliver. 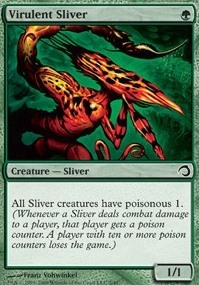 Virulent Sliver is not really so great as it has only poisonous and not infect. Meaning you have to hit 10 times with slivers and not for a total of 10 power. Maybe Sidewinder Sliver Might be a replacement for a turn 1 drop.